Villa Bellavista Dubrovnik overlooking the Adriatic is situated by the sea at the south-east end of the Dalmatian coast, amongst the cliffs of one of the most exclusive parts of the Dubrovnik region. It offers endless and spectacular views of the Mediterranean Sea and the picturesque old town of Dubrovnik which is only 500m walking distance away. Villa Bellavista Dubrovnik is a unique property and architectural masterpiece surrounded by flourishing gardens, olive trees and pinewood. Its outstanding white stone architecture and long tradition stands as one of Dubrovnik’s protected monuments. Villa Bellavista Dubrovnik is the perfect retreat, and an excellent base from where to discover this magnificent city, its surrounding islands and countryside. 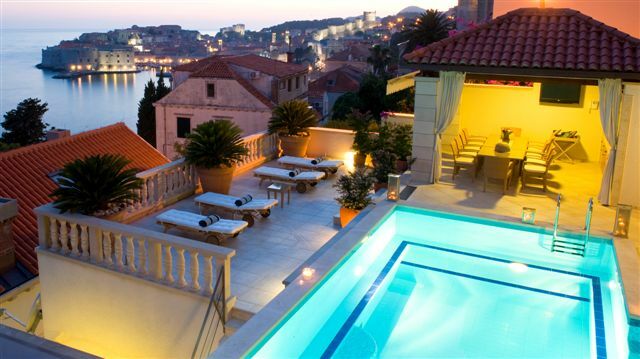 A stay at Villa Bellavista Dubrovnik is an experience like no other. When you wake up in this incredibly positioned villa with magical panoramic views over to the prestigious town of Dubrovnik, with the sounds of the waves crashing below you, it genuinely feels like your own piece of paradise on earth. Exclusive and luxury villa with private pool, gym, sauna, wine cellar, cardio area just a few steps away from the crystal clear sea, nestled amongst the cliffs of one of the most exclusive parts of the Dubrovnik region, offering endless and spectacular views over the sparkling waters of the Mediterranean sea and the picturesque old town of Dubrovnik. Six bedrooms, 5 bathrooms, amazing sea view, outdoor terrace with sun deck. Sleeps 12+2. This is one of the most luxurious front-line beach residences on the Dalmatian coast, which extends over 6500m² and consists of two parts – main building (three floors). Villa Bellavista is a very old villa, and it was built to exceptional standards and in ultra-contemporary design, preserving the style and charm created by the original architect and incorporating all the comforts of modern living. The first floor of the main building features a wide living room with piano, satellite TV and entertainment system, library, and fireplace. There is also a spacious dining area, a fully equipped professional kitchen with high-tech edge appliances. Spacious dining ocean-view terrace with seating for 12 guests and guest bathroom. The kitchen opens onto a beautiful covered terrace with barbecue area for blissful summer dining. On the second floor of this unique villa there are two spacious double bedrooms, each with en suite bathroom and king size beds. On this floor there is also large walk-in wardrobe room and private terrace with shower. The ground floor is a special part of the villa and consists of one large double bedroom with en suite bathroom and two large double bedrooms with shared bathroom. There is also a pergola with stunning views, glass covered, for relaxed seating. The pavilion with 360 degree view over sea and old town is ideal for cocktails and finger food. For those who would like to taste some of the best wines, there is a wine cellar with a large selection of exquisite and unique vintage wines. If you like to have a more active holiday or just to keep in shape, there is a gym area (30m²) with free-weights, TechnoGym machine, Cardio area with exercise bike, treadmill. In the relaxation area you will find the Spa with sauna for 6 people and sanarium, Bisazza steam room, solarium, Infra-red Shiatsu massage beds and bathroom. The outside area boasts a large outdoor pool with heating (10x4.5x 1.6m), counter-current and massage equipment, with stunning views of the crystalline sea and mega yachts anchoring in front of the old town of Dubrovnik. Also at this level is a large pergola, which allows the option of shade or cover for al fresco dining with panoramic views. Villa Bellavista Dubrovnik's property has been professionally landscaped with completely private terraced gardens featuring centuries old silver olive groves, a riot of radiant bougainvillea, lavender and pinewood, stretching all the way down to the beach with direct access. A garden pavilion and scenic terraces with seating and dining areas invite guests to relax, enjoy a cocktail and admire the scenery in complete solitude. Combining the highest standard of comfort and luxury Villa Bellavista Dubrovnik provides elegant Italian designer furnishing and modern amenities, including central air-conditioning hot and cold, state-of the-art entertainment systems, satellite TV in multiple languages, wireless Internet access, an emergency power generator, and a sophisticated alarm system with video surveillance located around the property.